I’m a local pup, born and bred in Worcester Mass. I grew up in the Railyards behind Union Station, watching the trains chug along. During the cold winter months I would skate through Elm Park, around the Oval, and sneak into the DCU Center to cheer on the hockey teams. 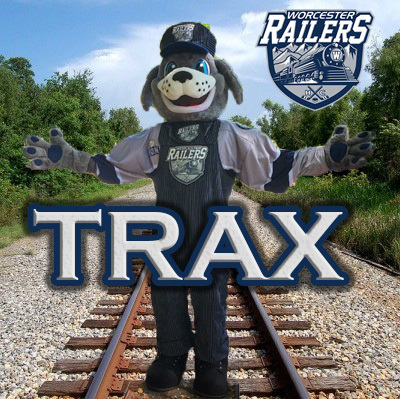 When the Railers came into town, it was only fitting that they would ask a loyal, hockey loving railyard dog like me to be their mascot. To book a mascot appearance please fill out the form below. All appearance requests must be made 2 weeks prior to the event date. If your appearance is less than 2 weeks away, please call (508) 365-1751. If you have any questions please email Paul Harris at PaulH@RailersHC.com. Once we have received your request, we will check our mascots schedule and contact you to confirm availability.